Motto(s): "The city that lights and hauls the world." Location in Schenectady Coonty an the state o New York. 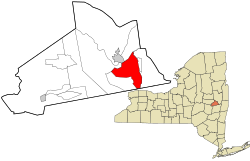 Schenectady /skᵻˈnɛktədi/ (skə-NEK-tə-dee) is a ceety in Schenectady Coonty, New York, Unitit States, o which it is the coonty seat.